Christopher Chope (Christchurch), Philip Davies (Shipley), Peter Lilley (Hitchin & Harpenden), Andrew Tyrie (Chichester), Ann Widdecombe (Maidstone & The Weald). Well done to them. The rest of the MPs have clearly failed to consider what they are creating. They seem to believe that reducing the UK to some kind of peasant society will somehow make the world watch in awe, making them world leaders. Please let your MP know what you think. To save yourself some effort, you can send a message to your MP through this neat service. But a letter might count for more. A couple of readers have emailed us with their letters, and they are most excellent. If you want to cite any data, or research, but don’t know where to find it, we’d be happy to help. Let us know through our contact page. The Climate Change Bill. Part 2 – Appealing to Authority. Here is an exchange between Peter Lilley MP, and other members of the House of Commons on Tuesday’s reading of the Climate Change Bill. Notice how Elliot Morley cites Stern and Lord Turner as authorities. It is as if Stern had no critics. The entire house of commons appears to be in his thrall. One man, who now is Vice Chairman of a group of companies with a commercial interest in climate change legislation, is being cited in lieu of democratic debate. Lord Turner, who is also cited, has written no more than a letter to Ed Milliband. And Lord Turner, as a former Trustee of the World Wildlife Fund, and a former member of the board of advisors at Climate Change Capital, cannot be said to be politically impatial, nor without financial interests. The house voted hugely in favour of the ammendments to the Bill, which means that shipping and aviation will now be included in the 80% target. If the bill is passed, then it will mean big fat profits for Stern, Turner, and their associates as shipping and aviation companies seek their services. Meanwhile, people in the UK will be unable to afford to travel, facing rising costs, and face job losses. Mr. Lilley: I draw the House’s attention to my declaration in the Register of Members’ Interests. In the speeches of a number of hon. Members, it has been assumed that the whole House is unanimous on the measures before us, and on the Bill that they amend or add to. Historically, the House has made its worst mistakes not when it is divided, but when it is virtually unanimous; not when it is adversarial, but when MPs switch off their critical faculties in a spasm of moral self-congratulation. My concern is that, in considering these measures, we are displaying that tendency. It is vital that we bring the House back down to earth by considering the hard costs and benefits of, and alternatives to, what is proposed and what we are doing. We have not done that very much so far in the debates in the House. Only once in Committee was mention made of the costs and benefits of what we are proposing. Mr. Morley: The right hon. Gentleman will find that, apart from the Stern report, which addressed the issue of costs and benefits, the report by Lord Turner specifically identified some of the projected costs for his recommendations, which are now being incorporated in the Bill. They were relatively modest. Mr. Lilley: I am not in any way disputing what the hon. Gentleman says, but no hon. Members, in either the House or Committee, have addressed the question of costs and benefits. They could have done so, as the Government have produced an impact assessment spelling out their estimate of the costs and benefits involved. Those figures are all we have when it comes to trying to assess the costs and benefits of the specific clauses and amendments before us. The Government’s impact assessment has three very important implications. The first is that the costs of the Bill as a whole are potentially huge, and they will be even more onerous if these proposals are accepted. The impact assessment puts the transitional costs at between 1.3 and 2 per cent. of gross domestic product up to 2020. In addition, there will be competitive costs to this country as a result of industry being driven overseas, even though that will not reduce the level of carbon emissions. Ignoring both those costs and making the heroic assumption that British industry can instantly and perfectly implement the latest and most cost-effective technology to meet the targets, means that the estimated cost of the Bill as a whole—even before the target for emission reductions is increased from 60 per cent. to 80 per cent.—comes to £205 billion. That is a lot of money. We have to ask whether we are prepared to increase it by including aviation and shipping, as the measures before us propose. I do not know whether hon. Members have consulted their constituents, but £205 billion would equal over £10,000 from every family in every constituency. People are used to hearing about the large sums of money being used to rescue the banks, but that has been in the form of loans that one hopes ultimately will be repaid. The costs that we are incurring through the amendments—and by the Bill even if it remains unamended—are real money. Our constituents will cough up that £10,000 in taxes and lost incomes, and never see it again. Before we add even more onerous burdens by including aviation and shipping in the Bill, we must be very sure that we are happy with the costs that we are already incurring. Secondly, we need to look at the benefits, which the impact assessment also considers. Although it shows that the maximum costs, even excluding all the things proposed in the measures before us, are potentially £205 billion, the striking thing is that it puts the maximum benefits of the actions proposed in the Bill at £110 billion, or just over half that total. Do the authors of the new proposals believe that their costs will eventually exceed their benefits, as is the case with the Bill as a whole, or can they reassure us that the benefits will be greater than the costs? Mr. Christopher Chope (Christchurch) (Con): Will my right hon. Friend give way? Colin Challen: Will the right hon. Gentleman give way? Mr. Lilley: I will give way in a moment, and especially to the hon. Member for Morley and Rothwell (Colin Challen). broad case on a narrow foundation. The remarks that he is making are, in terms of good order and debate, more strictly applicable to later parts of the Bill, and particularly to Third Reading. Therefore, I really must direct him to the specific matter covered in this group of new clauses and amendments. Mr. Lilley: Of course I take your remarks to heart, Mr. Deputy Speaker. We have to remember the normal laws of declining marginal benefit and increasing marginal cost. If we tighten the Bill by adding more rigorous burdens regarding aviation and shipping, we must expect the costs to be higher than the costs of meeting the 60 per cent. target, let alone the 80 per cent. target, and we must expect the benefits to be less than the marginal benefits that were to be accrued. David Howarth: The right hon. Gentleman will of course be aware of the work that Professor Barker did with Pan, Köhler, Warren and Winne, published in 2006 in The Energy Journal, which showed that as the targets become stricter, the world growth rate increases because of induced technological change. Economics has moved on slightly since he was at Cambridge. Mr. Deputy Speaker: Order. Oh dear. The hon. Gentleman is enticing the right hon. Member for Hitchin and Harpenden (Mr. Lilley) towards the wider aspects of the Bill again. I must remind the House that we want to make progress on to other matters, and we should therefore stick strictly to the terms of the amendments before us. Mr. Lilley: I will do just that and avoid discussing with the hon. Member for Cambridge (David Howarth) my experience of Cambridge, which was splendid. I instead return to the measure before us, which asks the Committee on Climate Change to assess the cost of including aviation and shipping in the Bill. However, the new clause does not say how those assessments are to be made. We must assume that they are to be made on the basis that Lord Stern used to assess the costs and benefits in the report to which the right hon. Member for Scunthorpe (Mr. Morley) referred, or on the basis used in the impact assessment that the Government put before the House, although that assessment refuses to give us any costings specifically on aviation and shipping. It is interesting that the impact assessment totally contradicts Lord Stern, who said that the costs of the measure, including aviation, would be far short of the benefits. Of course, he only reached that conclusion by discounting the future at such a low rate that the benefits exceeded the costs. According to Nordhaus, the leading valuator of this sort of methodology, half the benefits that Sir Nicholas Stern takes into account will not occur until after the year 2800, but so low is his discount rate that they outweigh the costs that we will incur in this century. their calculations show that the costs are not necessarily much lower than the benefits, and could well be twice as great as the benefits. Presumably, if the Committee follows the Government’s methodology, it could reach the same conclusion for aviation and shipping. Mr. Lilley: I give way to the hon. Gentleman, who made by far the best speech on Second Reading. “Upper end of the range assumes no technological change”? I suggest that the right hon. Gentleman is being a little pessimistic about aviation and shipping, and about the cost-benefit analysis. Mr. Lilley: I may be wrong, of course, but I am using the Government’s figures. Throughout the debate no one else has bothered even to mention the Government’s figures, and they were mentioned only once in Committee. It is only sensible that we should do so, and if we do, and if in particular we reach the conclusion that they should use the methodology implied in the impact assessment and not the absurd methods used by Sir Nicholas Stern, now Lord Stern—he received his reward—they would reach a conclusion very similar to that advocated by the hon. Gentleman on Second Reading: that we should put far more emphasis on adaptation to helping poor countries cope with climate change, rather than on crippling our industries—aviation, shipping and all the other industries—to little avail. Mr. Lilley: I give way to my hon. Friend, who made the equal best speech on Second Reading. Mr. Tyrie: I hope that my right hon. Friend has not devalued the compliment that he threw across the Floor of the House; heaven knows what he will say when another Member seeks to intervene. The question at issue has been whether technology in aviation and shipping can proceed at a pace to enable the costs to be kept reasonably low and therefore to allow us to pick up the benefits of a low carbon technology without extra cost. Is my right hon. Friend aware that the leading estimates of the improvement needed in carbon productivity are that it needs to increase fourfold over the next 40 years—that is, that the average of the past 15 years, which is 1.5 per cent. per annum, needs to increase to about 6 per cent. per annum if we are to get anywhere near meeting the 80 per cent. target? Will he speculate on whether it is plausible that a fourfold increase can be achieved? Mr. Lilley: That would be extremely demanding, but the implications of the Government’s impact assessment both for aviation and shipping and for industries more generally is that we must find more effective ways of reducing costs and carbon utilisation than they themselves think are available or would result from the measures in the Bill. Either that, or we must adopt the route proposed by the hon. Member for Wolverhampton, South-West (Rob Marris) and devote more effort to adaptation to climate change rather than mitigation, which would remove the burden—the almost impossible task—of bringing aviation and shipping into the scheme. It would also mean that, if global warming continues but turns out not to be predominantly the result of human activity, we would still be able to help the people in poor countries who would suffer from it, whereas we would not help them if we relied only on mitigation efforts. The implications of the clauses before us are extremely serious. We are potentially asking our constituents to bear a burden of £10,000 for every household, should we increase it. We are potentially producing benefits that may be only half the costs that we are incurring. We have been using a method to assess future costs and benefits that has been surreptitiously abandoned by the Government, but they have told us nothing about it. These issues ought to be discussed more fully before the Bill becomes law, and it is a sad day when Parliament refuses to face up to these hard facts. Alan Simpson (Nottingham, South) (Lab): There is a real danger of the House misleading itself into debates which, although important, are not the debates that should be taking place on the amendments. There are issues to be addressed concerning the methodology of impact assessments, but at this stage the House is being asked to address the principle of the inclusion of the Government’s assessment of carbon impacts in the way in which we set our carbon budgets. It is important to bring the debate back to that. It is also important not to allow ourselves to conduct a caricature debate about the choices that we face. The choices are not between unilateralism or multilateralism, or between mitigation or adaptation. We will have to do both. When the ship is sinking, the last thing we want to hear is someone running round the decks saying, “No action until there is a global refit.” If the ship is sinking, we want action taken on the threat that we face at that time. What we need to recognise from the scientific reports, which have been coming to us in their own tsunamis, is that the climate and the planet are the part of the equation that is in the process of taking the most enormous unilateral action. We will have to address huge upheavals in the whole framework of how we consider societies and economies capable of working viably throughout the whole of this century. I had hoped that the hon. Member for Birmingham, Yardley (John Hemming) would be here for his customary intervention on this issue. The answer to the question about oil is that by the time we come out of the current global financial crisis, two things will be queuing up. The first will be the climate crises already in the pipeline. Secondly, by that time we will probably have passed the peak oil level anyway, and we will have to move to a post-oil economy if we want a viable economy of any sort. Author EditorsPosted on October 31, 2008 Categories BlogTags Climate Change Bill, Lord Adair Turner, Nicholas Stern2 Comments on The Climate Change Bill. Part 2 – Appealing to Authority. The Climate Change Bill. Part 1 – They Don't Work for You. The third reading of the Climate Change Bill took place in parliament yesterday. More on that later. The reading was preceded by an Early Day Motion (EDM) to include shipping and aviation in the scope of the bill. That this House welcomes the Prime Minister’s decision to ask the Shadow Committee on Climate Change for early advice on the Climate Change Bill to inform the final stages of debate in Parliament; congratulates the Committee and its chair Lord Turner for providing robust advice despite the time pressure; welcomes their recommendation that the United Kingdom should be more ambitious in its target with cuts in greenhouse gas emissions by 2050; further welcomes Lord Turner’s further statement that this should include all emissions, including aviation and shipping; and urges all parties to support amendments to incorporate these changes in the Climate Change Bill. The policies that the MPs signing this motion want to create will lead to a loss of jobs and a substantial reduction in the standard of living for people throughout the UK. Meanwhile, members of the Climate Change Committee, the companies they work for and are associated with will profit handsomely from the legislation they have created. MPs are elected on the basis that they will take part in political, democratic debate. Instead, the following gutless, spineless, and brainless UK MPs have put their name to a motion to defer policy decisions to an unaccountable, undemocratic, and self-interested committee, whose decisions are based on spurious calculations about the future. If your MP is listed below (find out here), let them know (here) what you think about their climate posturing, their failure to subject environmental policies to scrutiny, and their deferring of political debate to an undemocratic committee. Ask your friends and relatives to do the same. Author EditorsPosted on October 29, 2008 Categories BlogTags Climate Change BillLeave a comment on The Climate Change Bill. Part 1 – They Don't Work for You. Prince Charles has warned that the financial crisis should not distract from the longer-term problem of the “climate crunch”. Speaking during a visit to Tokyo, the Prince of Wales said the global economy was “rightly a preoccupation of vast significance and importance”. The trip is part of a wider tour of the Far East, which will also see the prince and the duchess travel to Brunei. Charles will later journey on to Indonesia alone. In other words, Prince Charles, the multi-multi-multi millionaire, owner of one of the biggest estates in the UK, and heir to even more, who has never done a stroke of work, who has people to put toothpaste on his royal toothbrush, who doesn’t ever need to worry about what he can or can’t afford, losing his job, or having his home repossessed, whilst swanning around the world in luxurious accommodation and transport says that he thinks we might have our priorities wrong. Charles called on developed nations to cut carbon emissions by 70% to 80% by the year 2050, saying any crisis faced today would be nothing compared with what would befall the world “if we continue on a business-as-usual basis”. “The scientists tell us there is just the smallest window left for us to make the transformational changes in the way we live needed to stop catastrophic climate change,” he said. As we have pointed out, ‘the scientists’ say no such thing. His 38-year-old Aston Martin now runs on bioethanol from surplus wine, while his fleet of Jaguars, Audi and Range Rover use biodiesel made from recycled cooking oil. Once, such ‘can’t they eat cake’ indifference to the dirty masses might have given rise to calls for his head to be removed from his shoulders. Today, of course, what he says is in agreement with the anarchist ‘revolutionaries’, class warriors and ossified socialists at the Climate Camp. Their heads are as remote from their shoulders as Charles’ is. An aristocracy is a form of government by an elite that considers itself to possess greater virtues than the hoi polloi, giving it the right to rule in its own interests. Aristocrats were referred to as ‘the nobility’, or ‘nobs’. These days we prefer decisions to be made democratically – the idea being that we can judge for ourselves which ideas serve our interests, thank you very much, ma’am. But in recent years, politicians have sought legitimacy for their positions from outside of the democratic process. A new aristocracy is emerging from the emptiness of UK politics – and it’s considerably more virtuous than thou. Last Thursday, foreign secretary Ed Miliband announced the government was committing to an 80 per cent cut in greenhouse gas emissions by 2050 – up from 60 per cent. This was the latest in a game of politics by numbers, in which the major parties outbid each other to commit to the most punishing targets, each party claiming that its own reduction target best represented ‘the science’. Embarrassed at being so easily trumped, environment secretary Hilary Benn announced changes to the Climate Change Bill – being debated today – last October. A new Climate Change Committee (CCC) of scientific and economic experts would advise Parliament on what targets best represented the science. Ed Miliband’s announcement followed the first advice from the CCC, given to him by the Committee’s chair, Lord Adair Turner, in a letter earlier in the week. Climate science cannot predict with absolute certainty how emissions paths will translate into temperature increases and how temperature increases will translate into damage. Deciding what level of temperature increase is harmful is therefore inherently judgemental. Yet public scrutiny of this judgement call is disastrously absent from the climate change debate. For example, according to the conventional wisdom, “climate change will be worse for the poor”, and this forms a substantial part of the argument for emissions reduction. But an argument for making people wealthy could have the same basis. After all, the human cost of extreme weather in the developed world is far lower than equivalent phenomena in poorer countries. But arguments for wealth are necessarily political. They depend fundamentally on us understanding our own interests. Meanwhile, the argument for drastic carbon reduction and lifestyle change is principally ethical: it claims that matters of fact exist, which dictate the terms and limits that society must respond to, or else we will face catastrophe. At the same time, the argument goes, politics can only fail to respond to these matters of fact, because people are too self-interested, and lack the ability to understand the complexities of climate science. In other words, we lack the virtues necessary to make decisions about the future. Moreover, politicians have mirrored the public’s cynicism of politicians with their own cynicism of politics. Accordingly, they are ever keener to demonstrate their ethical credentials – their virtues – than they are in explaining the potential of their political ideas. They don’t have any. Contrary to many a green claim, science has been unable to provide unambiguous advice from which climate change policies can be formulated. Hence Labour, the Tories, the Lib-Dems, the Greens, and various activists, have all made different policies, and argued that the others will lead us inevitably to environmental catastrophe. The CCC has been appointed in an attempt to settle the matter because matters of fact simply do not exist, and politicians lack the authority to make an ‘ethical’ argument for climate mitigation themselves. According to the CCC, the 60 per cent figure which appears in the Draft Bill was based on advice given in a report by the Royal Commission on Environmental Pollution (RCEP) in 2000. “Since the report, however, new information has become available”, says the CCC. But this information is not uncontroversial, and no matter how many climate studies have produced research which reveal isolated trends that are worse than anticipated, it is the sum of their effects which is important. The Royal Commission produced its recommendation after considering a range of emissions scenarios and their likely outcomes in terms of global temperature changes. 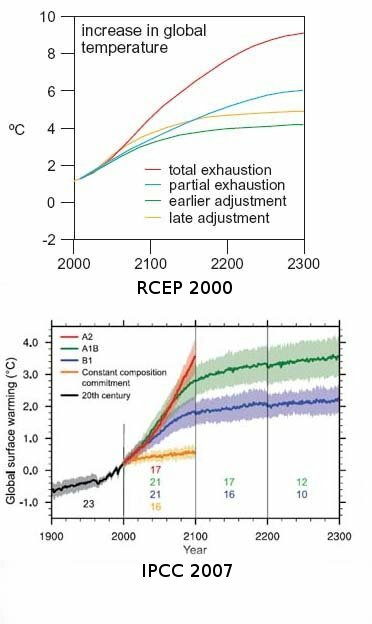 The IPCC in 2007 did a very similar thing. 2007 saw the IPCC more optimistic about the extent of future warming than the RCEP were in 2000. So why isn’t the CCC calling for a reduction in CO2 emissions targets? Perhaps it could still be claimed that society is more vulnerable to climate than was previously understood. But, again, this is not “science”. It’s a speculative claim about the extent to which the direction of society is determined by climatic conditions – and exactly the kind of soft judgement which Turner admits. Yet the Committee is unable to reflect on the judgements it has had to make because reflection is beyond the Committee’s scope of enquiry. Moreover, The CCC’s members have no interest in doing so. Vested interests abound. So the people who stand to profit from markets created by climate change legislation are instrumental in creating that legislation. Another member of the CCC is Lord Bob May, who has been increasingly vocal about climate change politics in recent years. He said in the TLS last year that “there remains an active and well-funded ‘denial lobby’. It shares many features with the lobby that for so long denied that smoking is the major cause of lung cancer.” But if May is worried about ‘well-funded’ financial interests influencing the Government, he might well take a hard look at the CCC itself. So the small number of people who determine the UK’s response to climate change are not independent, and appear to have professional, financial and political interests in both the escalation of the climate crisis, and legislation designed to prevent it. These interests and the wider establishment’s political exhaustion are hidden behind the CCC’s scientific authority – a virtue in accordance with climate change ethics. As politicians have struggled to define themselves politically, they have retreated from democratic ideas. Voting is merely a formality – there are no ideas being contested, and legitimacy is sought instead from other public institutions such as ‘science’. The purpose of new committees of experts is not to inform the climate change debate, but to create ethics for politicians to clothe themselves in. It gives seemingly legitimate purpose and direction to a purposeless and directionless establishment. The purpose of the climate change bill is not to save us from catastrophe, but to set the scene for a new climate change aristocracy to rule over us in its own interests. Read Ben’s article on the Register, about the Climate Change Bill being debated in Parliament today, and the elite who stand to gain from it. 'Fuel Poverty' or Fool's Poverty? Campaigners failed today in a high court bid to force the government to spend more to end fuel poverty. Mr Justice McCombe, sitting in London, dismissed an application for judicial review brought by Friends of the Earth and Help the Aged to force the government to meet its targets for helping millions of vulnerable citizens who cannot adequately heat their homes. Friends of the Earth have been campaigning for higher fuel prices for years. When the market delivers it, they start taking the Government to court. How weird is that? It’s nearly as weird as their stance against biofuels, which they used to campaign for, until it became unfashionable because it hurts the polar bears. Households in fuel poverty are defined as those in which more than 10% of income is spent on energy. But far from the numbers falling, the past year has seen a steep increase as gas and electricity bills have rocketed. Do FoE really care about ‘fuel poverty’? They have been, for a long time, trying to persuade us to use less fuel, to consume less, to travel less, for more taxes on fuel, and for ‘strong climate law’. If FoE don’t want us to do anything with our money, why should it care what we spend on fuel? This writer cannot currently afford a new desktop computer. Does that mean he is in ‘computer poverty’? The latest official figures show that 3.5 million households in the UK were in fuel poverty in 2006, but that figure is though to have risen to around 5 million, and the charities argue that many of these people now face a stark choice of “heat or eat”. Clearly the problem for people who spend 10%+ of their income on fuel is that they don’t have enough money. But to say so would leave FoE’s critique of ‘consumer society’ rather hollow. ‘Fuel poverty’ has been invented to create leverage in political arguments for environmental terms. We can’t speak about simple ‘poverty’ any more. The understanding of ‘justice’ has been displaced by ‘environmental justice’. FoE’s concern for the 5 million households is hollow. They aren’t campaigning for an increase in oil production, nor for people to have access to more energy. •That the Government itself has admitted that targets to reduce and eventually eliminate fuel poverty will be missed. on the Government to develop a far more effective and comprehensive programme of domestic energy efficiency to simultaneously end suffering from fuel poverty and tackle climate change. The answer to ‘fuel poverty’ in FoE’s case is for their homes to be better insulated, not for them to achieve economic independence. In other words, the issue is not that people are poor, it’s that there is insufficient legislation to regulate the design of their homes. This is ‘environmental justice’. It cares not one jot for the poor. It doesn’t want them to be rich, it just wants them to be regulated properly. Author EditorsPosted on October 24, 2008 Categories BlogTags FOE, Friends of the Earth4 Comments on 'Fuel Poverty' or Fool's Poverty? A couple of our recent posts have looked unfavourably at the BBC’s coverage of the climate debate, in particular the three part series, Earth: the Climate Wars. But it’s not all bad at the Beeb, and it’s not fair to characterise their output as entirely biased in favour of environmental alarmists. That’s the kind of thing George Monbiot does. A year ago, we wrote about his groundless complaints that BBC’s flagship program, Top Gear – just an hour of broadcasting a week – was somehow influencing the public’s understanding of climate change. It is ‘irresponsible’, Monbiot whinges, to allow programming that features people enjoying cars. Top Gear remains one of the most popular programmes produced by the BBC precisely because it resists the boring nonsense issued from the self-appointed environmental censors. Top Gear presenter, James May has a new series running at the moment, James May’s Big Ideas, which is a positive look at the technologies which will shape the future. So far, flying machines, robots, and energy have been explored. The series is not a look at the climate debate. In fact, apart from a few sharp quips, it entirely ignores the prevailing misanthropic, miserable and pessimistic view of the future. So why are we talking about it here, on the Climate Resistance blog? … where we have more of everything we need to make our lives longer, brighter and bolder than ever before. And this will only get better. But not without the most vital and civilising commodity on earth: energy. May reveals a sophisticated understanding of humanity that the environmental movement simply just doesn’t have. Our use of energy is fundamental to all forms of development, not just our material wealth, but also political and social progress. Of course, cynics might (rightly) argue that at a time when we are using more energy than ever before, many aspects of consumer culture also happen to be particularly shallow. And it’s not as if all parts of the world enjoy both liberty and the excesses available to us in the West. The point is that abundant energy is a necessary, but not sufficient condition for progress. Without it – whether you’re a follower of anyone between or since Karl Marx and Adam Smith – you’re stuffed. And stuffed is exactly where environmentalists want you to be. Unable to move, locked into a ‘self-sufficient’, ‘low-impact’, ‘localised system of production’. In such a world, there is no need for political oppressors, because there is nothing with which to power a revolt – you’ll be too busy knitting your own lentils to organise against the ecocracy. Some people say our insatiable appetite for energy will destroy the world. Rubbish. We’re never gonna give it up, and we can’t get enough of the stuff. In fact, we need more. Much more. So here’s the big idea. I want enough energy to satisfy the world’s appetite. Not just for the next fifty, one hundred, or even two hundred years. I want it never to run out. Not easy. But fortunately, there are people all over the planet with ideas that might just make it happen. May goes off to explore just a few of the many energy technologies which are being developed, and that will, we hope, be allowed to create the abundance that May wishes for. In contrast to his Top Gear co-host, Jeremy Clarkson, May’s confidence about the future is quiet and unconfrontational. The problems we face have solutions in his view: us. People. The very same things that the environmental movement tell you are the problem. We are creative, and we live in a universe of almost limitless energy. The only thing that’s standing in the way of us getting it are the likes of the erstwhile UK chief scientific advisor miserablist, Sir David King, who, as we reported recently, believes that cash spent on scientific progress in the form of the LHC would be better spent on ‘tackling climate change’. Us environmental sceptics, deniers, realists – call us what you like – should regroup. May’s optimism is a better antidote to the environmentalist’s doomsaying than mere scepticism. Instead of challenging environmentalism on its own terms by saying that the future is not going to be a tragedy, we should start building more positive versions of the future, to make convincing arguments about what it could be like. Environmentalism has thrived in an era where such visions are absent. As we have said before, it is a self-fulfilling prophecy; it would deny us the means to solve the problems we face, leaving us unable to cope with the climate. Similarly, it is only positive conceptions of the future that can drive progress. To face retrogressive and mean-spirited environmentalism, there needs to be more than scepticism, and questions about the scientific integrity of the IPCC, the Hockey Stick, and computer models. Exposing the self-interest and corruption of greenwashed politicians also isn’t a sufficiently complete challenge to the circumstances that have given rise to environmental orthodoxy. May makes a good start. We should follow.